The Abudefduf damselfishes are a challenging group in many ways. 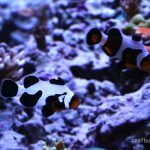 Aquarists know these to be some of the meanest of pomacentrids, but these fishes can be just as confounding to those brave souls seeking to understand their complex evolutionary interrelationships. In recent years, Abudefduf has seen a considerable amount of molecular and morphological study aimed at tackling this problem, but the results have created just as many questions as answers. 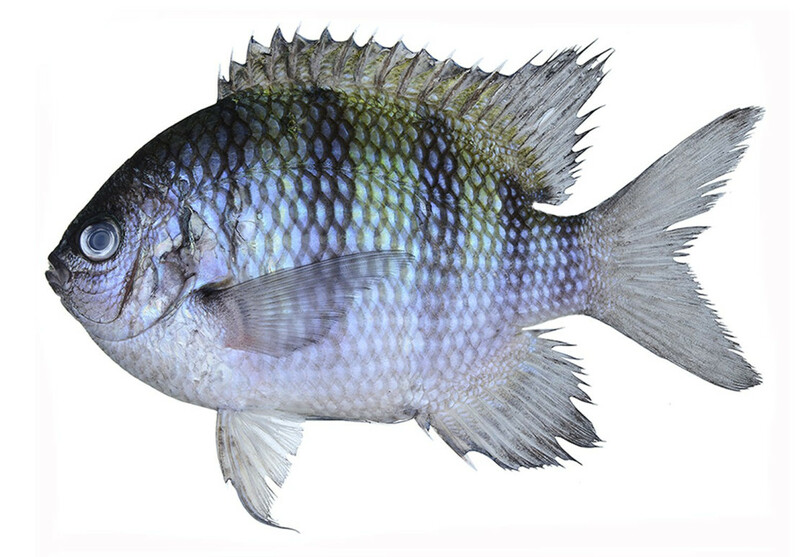 One of the most widespread and abundant of these damselfishes in the Indo-Pacific is the aptly named Indo-Pacific Sergeant (A. vaigiensis); however, genetic sequencing revealed there to be a number of inconsistencies with our understanding of it. For instance, the equally widespread Scissortail Sergeant (A. sexfasciatus), seems to readily hybridize with it in the Coral Triangle—the two share identical mitochondrial DNA, while maintaining separate nuclear genomes. Both of these widespread fishes also show strong evidence of cryptic species being present, though the precise nature of these are still uncertain. Likely, these follow the same pattern of biogeographic speciation common to many reef fishes, with isolated populations (i.e. “species”) present in the Red Sea and Western Indian Ocean, the Maldives and Andaman Sea, the West Pacific, Polynesia, and so on. But the different genes studied thus far have painted a muddied picture. 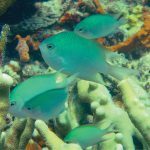 The most surprising discovery was the indication that there are at least four distinct and distantly related lineages of Sergeant Major-like fishes in the Indo-Pacific (which is in addition to the unresolved geographic diversity just mentioned). This issue was addressed in part by Wibowo et al. 2018, who investigated a large series of specimens in excruciating detail, ultimately finding evidence for two nearly identical species which had previously been treated as synonyms. And so the Spotted-tail Sergeant (A. caudobimaculatus) was once again allowed back into polite taxonomic society. It’s most distinctive feature is the presence of two minute black spots present near the base of the caudal fin, giving this fish its common and scientific names. Another trait to look for is the relative length of the fourth black bar, which ends a bit more abruptly in the soft rays of the dorsal fin when compared to A. vaigiensis. There are additionally several subtle details in the number of fin rays and scalation which we shan’t get into here. 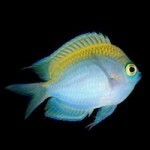 The type specimens for this fish come from the Ryukyu Islands of Japan and from the Java Sea, but genetic data suggests it can also be found in the Western Indian Ocean and Guam, indicating a very wide distribution in the Indo-Pacific. In the course of their investigation, these authors happened upon a number of specimens which failed to correspond to either of these taxa. 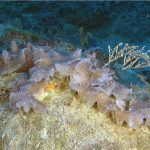 This required a new species to be described—the first new member of this genus in nearly two decades—the Black Margined-scale Sergeant (A. nigrimargo). Genetically speaking, it appears closest to the Bengal Sergeant (A. bengalensis), even though its color patterning is generally more similar to those species we’ve just discussed. The key difference to look for here is the extent of the black bars, which in both nigrimargo and bengalensis fail to reach into the dorsal fin (in contrast to caudobimaculatus and vaigiensis). 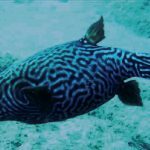 This fish is named for its other distinctive feature, the dark perimeter of its scales, which creates a subtle latticed pattern in the light interspaces. Remarkably, all three of these damselfishes have been collected together in Japan, raising difficult questions about just how and why they speciated in the first place. Why does the world need three virtually identical Abudefduf living in the same habitat, presumably feeding on the same diet, and more or less existing as interchangeable components in these ecosystems. Does anything truly differentiate these in a meaningful way? Were one of these fishes to disappear entirely, would anyone even notice? It’s said that God has an inordinate fondness for beetles, but I think the same can be said for this unnecessarily diverse genus. And there are likely to be even more of these dastardly damselfishes lurking out there still. Genetic data suggests another distinct lineage of vaigiensis-like fish exists in the Coral Triangle, known from samples collected in the Philippines and Bali. Not to mention there is still the lingering issue of the true biogeographic complexity in these widespread taxa. How many Abudefduf are there? We’re up to 21 of these little striped jerks now, but expect this number to climb in the coming years. Aguilar-Medrano, R. and Barber, P.H., 2016. Ecomorphological diversification in reef fish of the genus Abudefduf (Percifomes, Pomacentridae). Zoomorphology, 135(1), pp.103-114. Bertrand, J.A., Borsa, P. and Chen, W.J., 2017. Phylogeography of the sergeants Abudefduf sexfasciatus and A. vaigiensis reveals complex introgression patterns between two widespread and sympatric Indo‐West Pacific reef fishes. Molecular ecology, 26(9), pp.2527-2542. Piñeros, V.J. and Gutiérrez-Rodríguez, C., 2017. Population genetic structure and connectivity in the widespread coral-reef fish Abudefduf saxatilis: the role of historic and contemporary factors. Coral Reefs, 36(3), pp.877-890. Wibowo, K., Toda, M. and Motomura, H., 2018. Validity of Abudefduf caudobimaculatus Okada and Ikeda 1939 and synonymies of Abudefduf vaigiensis (Quoy and Gaimard 1825)(Perciformes: Pomacentridae). Ichthyological Research, 65(1), pp.78-91.